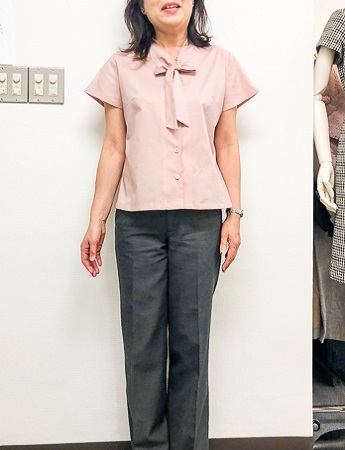 生徒作品1124☆１年生コース　ボータイブラウスがキレイに仕上がりました！　☆　The bow tie blouse is finished beautifully! Students who finished a useful blouse for the coming season. During the original course before proceeding to the first grade course, She said “When I look at this schools blogs, all students works the are very beautiful, I wonder if I can really do that too …”. I remember that she seemd mix of expectation and anxiety. After original course she did all tasks carefully and became a very beautiful bow-blouse! Greyish pink is also wonderful ♡ Learning with the item after this is ” drafting long sleeve pattern “.